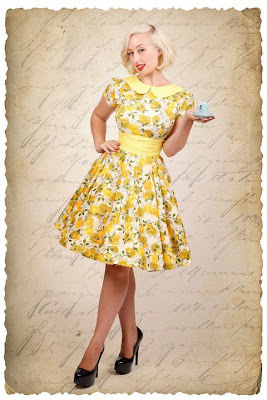 Miss Molly Doll: Move over Moxie Minx- Powderpuff Boutique's in town! Move over Moxie Minx- Powderpuff Boutique's in town! I have been soo busy the last few weeks, I just haven't had time to do a decent post on anything! Only 10 days til our wedding, so things are a little busy at the moment. Paula launched her vintage inspired clothing lable back in 2009, under the name Moxie Minx, but over the last year or so, has been forced to change Moxie Minx's name, thanks to a big bully sanitary item company. This has cost Paula alot of time, stress and money! But nothing gets this talented lady down! Paula has just re-launched her lable under the new name, Powderpuff Boutique. If you like, please, check out her brand spankin' new website HERE, and support a hard workin' momma! Or got and 'like' Powderpuff Boutique on facebook! Really cute stuff, but the sizing is all in Centimeters :-(....I need inches! Thanks for sharing this online shop link ! Love those pin ups , with lovely curves ! Kim- I'm sure there would be an online converter somewhere...I don't know what my measurements are in centimetres either, and I'm Australian! Lil' Jess- I always love finding new shops too. If you haven't checked out Miss Hussy Clothing- you should! Hayley is another girlfriend and her stuff is amazing too!